Turn-Key Flyer Templates Improve Marketing Efficiency Through Eye-Catching Innovative Template Design and Technology. Seal Beach, CA (PRWEB) November 5, 2009 — TurnKey Flyers (www.TurnKeyFlyers.com), a new and innovative real estate marketing template provider, launched their services to the world this month, bringing eye catching designs and simplicity to real estate flyer marketing. Agents need only 5 minutes to develop and produce professional-grade marketing, with no special software to install, and no design experience necessary. Real estate agents around the globe can create a professional and upscale image of their business when they use premium marketing templates, dramatically cutting their workload down from hours to minutes. 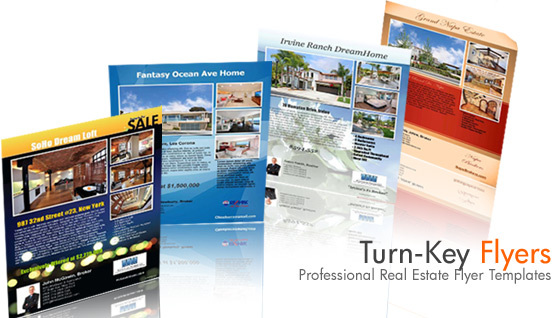 Turn-Key Flyers has simplified the process by creating various professional pre-designed PDF real estate flyer templates. Agents purchase and download a collection of PDF real estate flyer templates and simply add their property information directly onto the flyer. New flyers can be made without the hassle of designing from scratch. Each flyer brochure can be saved as a PDF, printed, or emailed.